DADaPalooza: Meet the Fresh Beat Band at J & R's today at 4 pm! Meet the Fresh Beat Band at J & R's today at 4 pm! Please note: The band will not be performing. Purchase the New Album: The Fresh Beat Band, Vol. 2.0 and have your photo taken with Kiki, Marina, Twist and Shout. One photo per CD purchase. The Fresh Beat Band is Nickelodeon's popular preschool music group and stars of the Emmy Award-winning TV series of the same name. 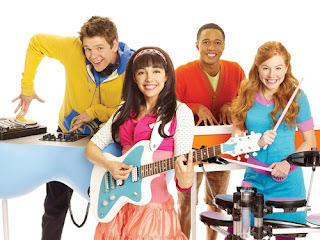 The Fresh Beat Band centers on four best friends – Kiki (Yvette Gonzalez-Nacer), Marina (Tara Perry), Twist (Jon Beavers), and Shout (Thomas Hobson) – in a band who love to sing and dance. In each episode, preschoolers sing and dance along as they help The Fresh Beat Band solve everyday challenges. Preschoolers learn the fundamentals of music such as melody, rhythm, tempo and performance styles and the importance of friendship, working together, and respecting each other’s differences.